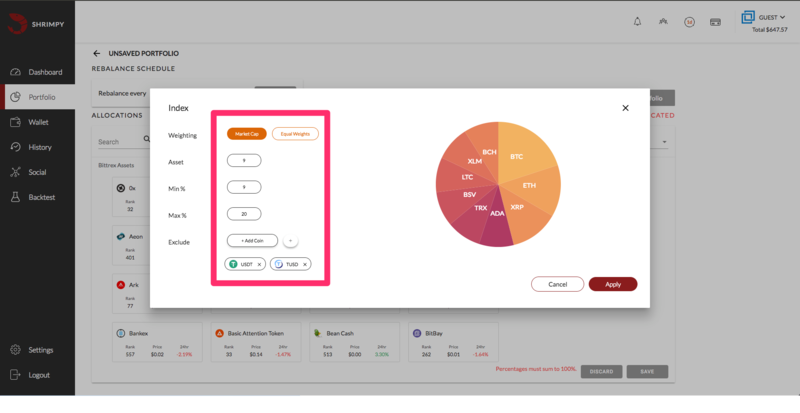 Indexing the cryptocurrency market is a simple 4 step process with Shrimpy. It's easy to get started and a breeze to change at any time. We begin by navigating to the "Portfolio" tab. If you have already created portfolios in the past, this is where they will show up. If this is your first portfolio, you will only see a single card to "Create new portfolio". 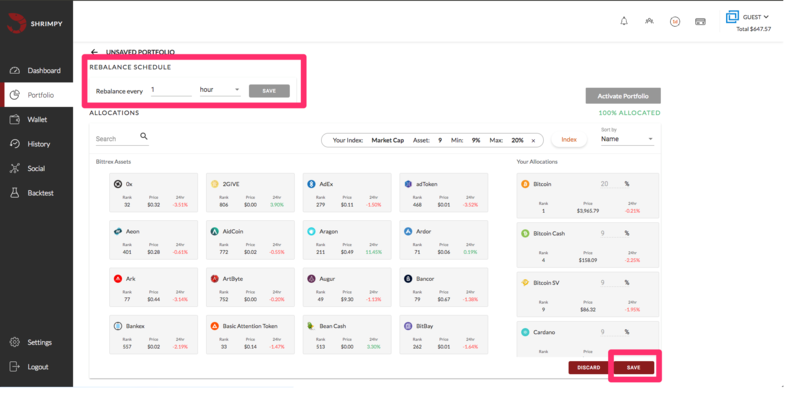 Click to "Create new portfolio"
The screen that you see after clicking to create a new portfolio is the "Allocations" screen. This is where you select what allocations you would like to have in your portfolio. In order to create an index, you will need to select "Index" on this screen. You can find this in the highlighted location. You are now in the meat of the index creation. The popup that appears after clicking the "Index" button will look like the following. It will have a number of configurations that you can adjust to create the index that is best for you. Let's walk through these different options. Weighting: Indexes in Shrimpy can either be weighted by market cap or evenly distributed. Asset: This is the number of assets you would like to hold in your portfolio. You must select a minimum of 1 and a maximum of 30. This will take the top "X" number of assets by market cap and maintain them in your index. Min %: This is the minimum percent weight you would like for any single asset. For example, if you don't want any asset to take up less than 2% of your index, you can set a minimum of 2%. Max %: Similar to min %, this is the maximum percent weight you would like for any single asset in your index. For example, if you don't want Bitcoin to consume over 50% of your portfolio value, you can set the max percentage to 50%. Exclude: You can exclude any asset from your index. 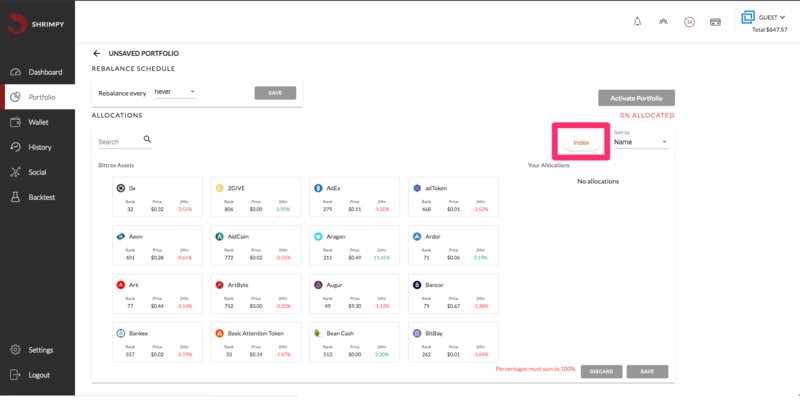 For example, if you don't want USDT since it is a tether, you can exclude it from your index. Once you have clicked "Apply" on your index settings, you will still need to save your portfolio or else your changes will be lost. Don't forget to also select a rebalance period so Shrimpy can maintain your allocations over time!